The 13.3-inch Acer Aspire S3-951 is a pleasing surprise for net book lovers. It has great advantages for people who frequently move all around. The book is good for usage with a nice keyboard and track pad. Its battery life is also extensive and long. The Acer Aspire S3 has a moderate weight of 1.38kgs. It is slightly heavier than other Macbook air. The extra weight helps to make a good grip over it. The Aspire S3 looks good, and handle well when folded. The power switch of the S3 is next to its two small indicator lights. For the purposes of extension it has two USB 2.0 ports and an HDMI port. A headphone jack is on the left hand side, and an SD card slot is on the right. The device has a muted gray keyboard that is just similar and fuses into the chassis and known for the tiniest set of navigation keys (arrows, Page Up, Page Down, and the like). The display has an average 1366-by-768-pixel native resolution. The screen is bright and colorful. The photos even appear smooth and catchy on the screen. 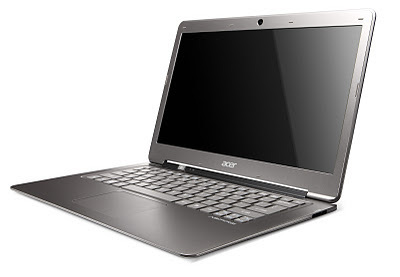 The Acer Aspire S3-951 has a pair of very small speakers that emit through the bottom and the keyboard. The speakers sound tinny. Its battery life provides an interesting power back up of seven hours easily. It is available in price tag of Rs 50, 984 in Indian market.